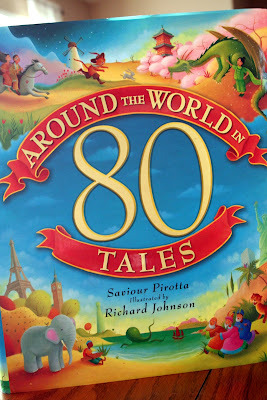 Somewhere I heard reference to the book Around the World in 80 Tales by Saviour Pirotta and filed the book name away in the back of my brain, put it on my wishlist at Amazon and figured I would never get around to buying it. Because we have a plethera of geography and other random books around this house, and adding one more book might just throw us into the major fire hazard category. 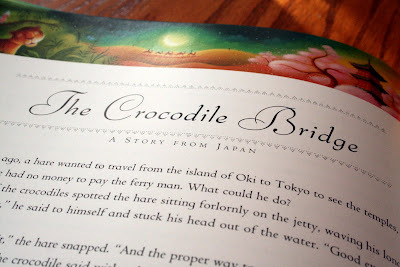 And please tell me I'm not the only one who finds this book beautiful. It was so pretty I had to take pictures of it. Dragged my mom into the room so that she could drool over it with me. 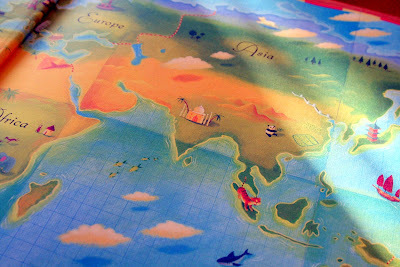 Opening it up, the inside cover and facing page is a beautifully illustrated map of the world. 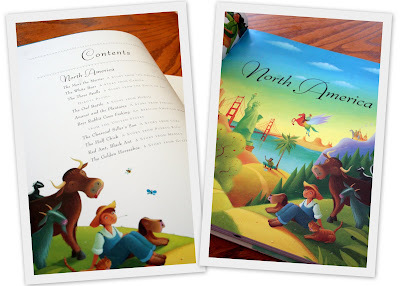 The book has eighty folktales from six continents and the stories are broken up by the continent they take place on. 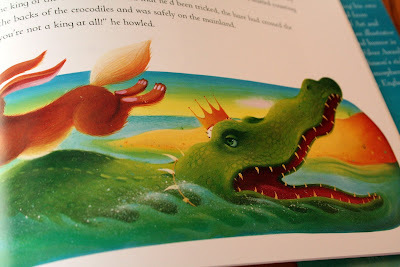 ...and the illustrations we loved. The stories had our three oldest laughing and begging for more. And how am I supposed to say "no" to that? Thank you for your kind comments about this book. It was a lot of hard work to research and write, but very enjoyable too. We absolutely love our copy too. I reviewed it for HOTM (though I purchased it myself) and I am still in love with it. Glad to hear your family is enjoying it as well.